I don’t know what it is about cherry tomatoes but I’ve become slightly obsessed with them. This seems crazy to me considering I didn’t even start eating raw tomatoes until I was in college. They taste so sweet and fresh plus they are just so darn cute! 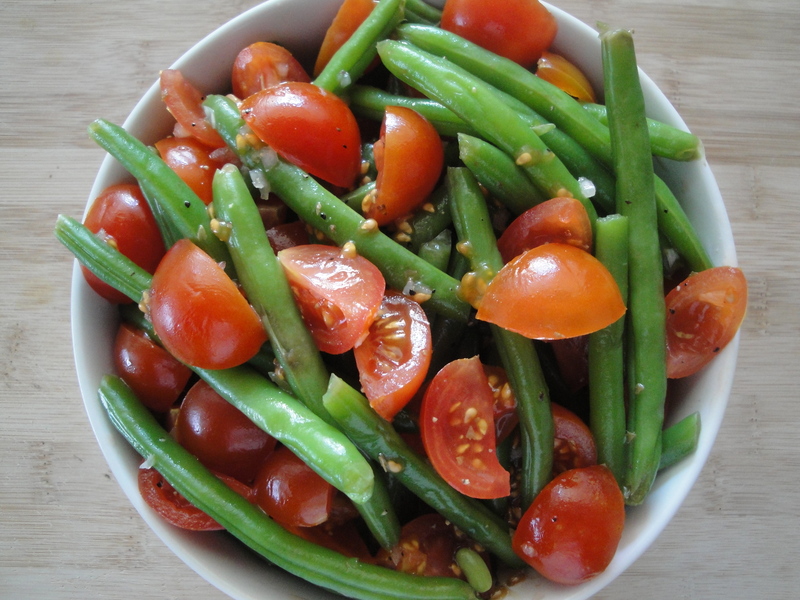 I’ve been holding on to this recipe for Green Bean and Cherry Tomato Salad for a very long time. The reason I know this is because everytime I look at my vegetable recipes, I always come across this one, am struck by the vibrant colors, and wonder why I haven’t made it yet. 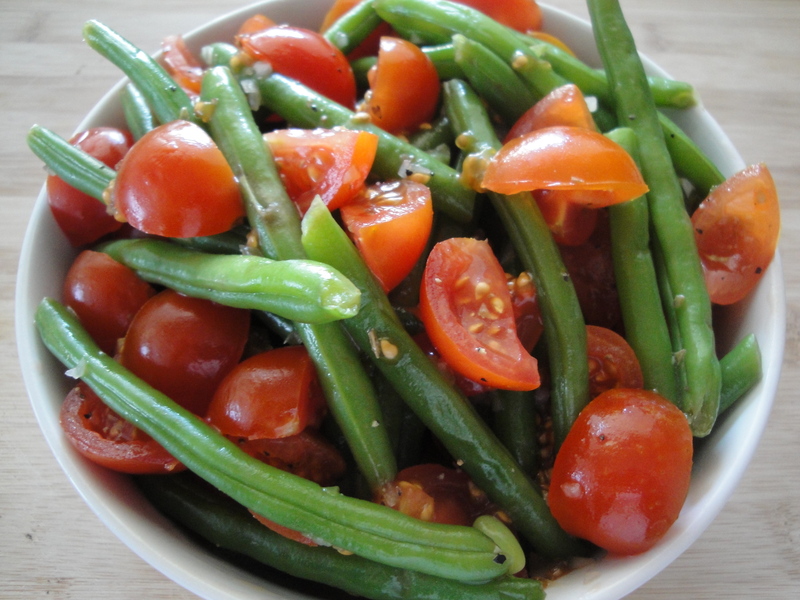 With both green beans and cherry tomatoes being on sale this past weekend, I knew this was the time to get it done. Well, let me tell you, it didn’t disappoint. 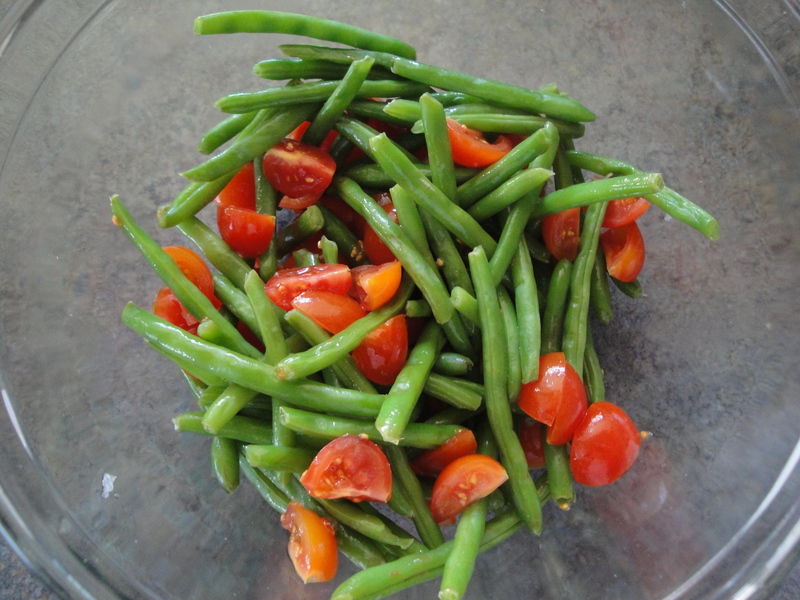 Green beans are cooked until perfectly green, mixed with sweet cherry tomatoes, then coated in a light vinaigrette of oregano, shallots, red wine vinegar, and olive oil. I used dried oregano and white wine vinegar (because I had no idea that I didn’t have red wine vinegar in my cabinet) so use what you have. This salad is best served nice and cold, right out of the fridge, and makes for a nice side to your meal or even a light meal by itself. Cook the green beans either in the microwave (according to package directions) or in boiling water until bright green and tender (approximately 7 minutes on the stove). 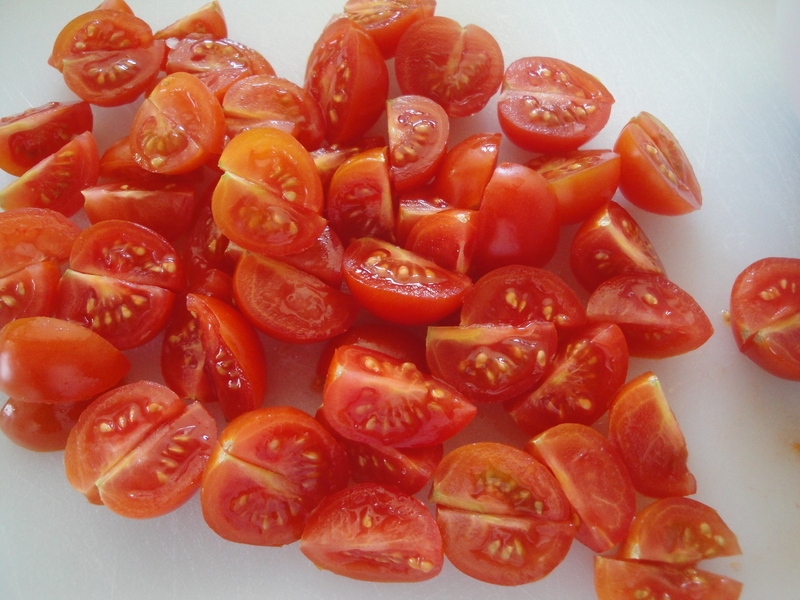 While beans cook, quarter the cherry tomatoes. 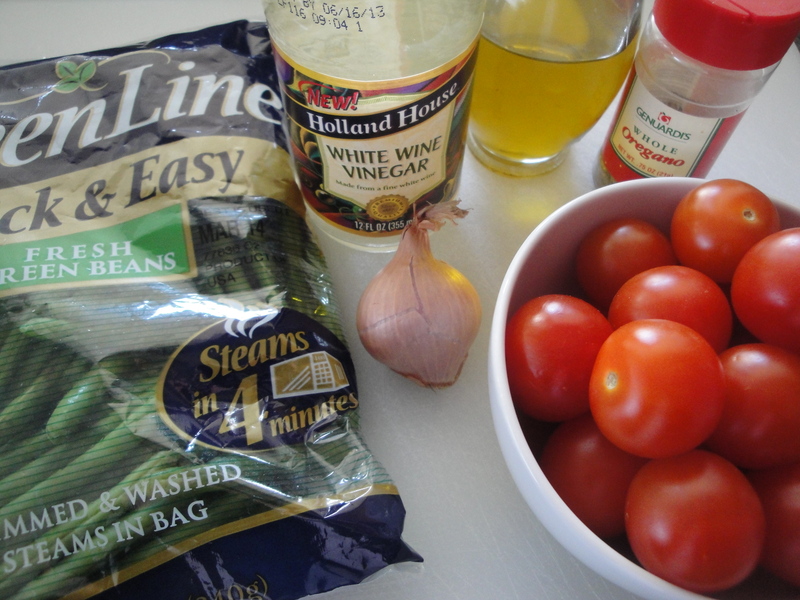 Place cooked beans in a bowl with quartered tomatoes and fresh oregano. (Since I used dried oregano, I didn’t add it here but with the vinaigrette instead). 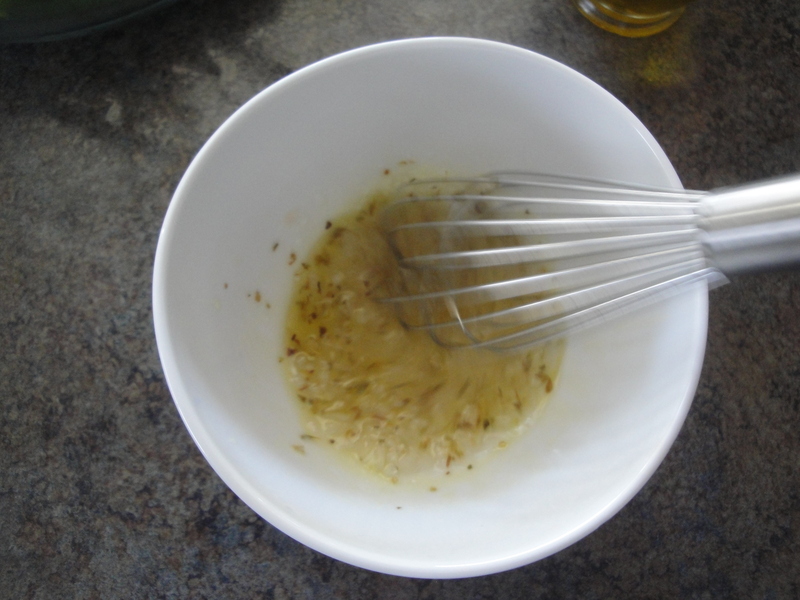 Combine shallots and vinegar (and dried oregano) with a whisk and allow to sit for 10 minutes. Add salt and pepper. 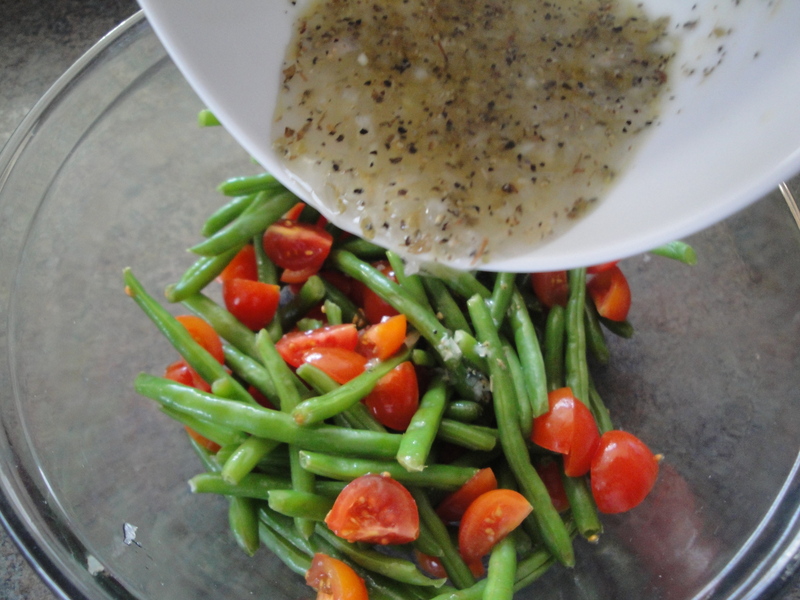 Pour the vinaigrette over the bean mixture and toss. Serve cold.